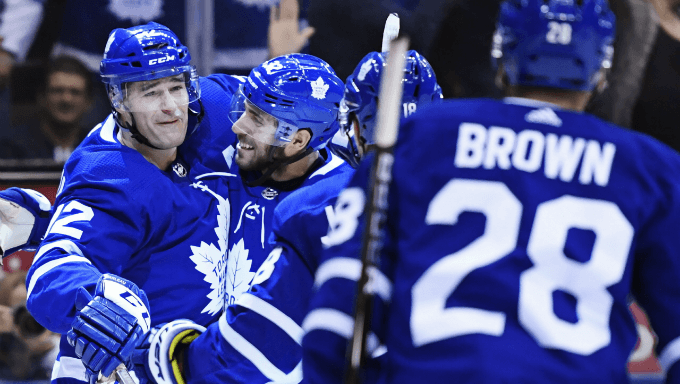 Some skeptics (hand raised here) didn’t know if the Toronto Maple Leafs had enough defense and goaltending to be the kind of power others predicted they’d be, especially after getting John Tavares in the offseason. Well, who cares about defense and goaltending when you’ve got an offense like Toronto’s. After Monday’s games, Toronto led all teams in goals with 33. Yeah, only one team had allowed more than the 23 of the Leafs. But that offense! One interesting team here: Chicago. Each of the Blackhawks’ first five games went to overtime, and they’re 5-0-0 against the spread. Anyone who counted the Hawks out this year, following an injury-ravaged last season, didn’t do their homework. They’ve still got Jonathan Toews and Patrick Kane, and goalie Corey Crawford is expected to play his first game in 10 months on Thursday night. It’s still real, real early, but some of the teams NHL betting markets believe will be near the top thought would be near the top (Toronto, Nashville) are, while some like Winnipeg and San Jose are off to mediocre starts. On Monday, it was learned center Paul Stastny will be lost for two months with a lower-body injury. Bad break for the Golden Knights, who got off to a 2-4-0 start and have had trouble scoring goals (11 through the first six games) even with their top off-season free-agent acquisition. Don’t give up on Vegas just yet at the betting window, though. They don’t seem to have adjusted very well to being a favored team; maybe now they’ll embrace more of the underdog mentality that took them all the way to the Stanley Cup Finals in their first season. At +1700 on 888Sport to win it all, the Golden Knights remain an attractive buy, but they probably will have a tougher time making the postseason this time. Vegas has home games this week against Buffalo, Vancouver and Ottawa, so look for them to move up. They haven’t played many games yet, thanks to a start of the season in Europe for NHL international games, but look out for the New Jersey Devils. The Devils outscored opponents 14-4 in the first three games. They feature defending Hart Trophy winner Taylor Hall, and 2017 No. 1 overall pick Nico Hischier is the real deal. At +3200 on 888Sport to win it all, bettors should be making early plays on this team.